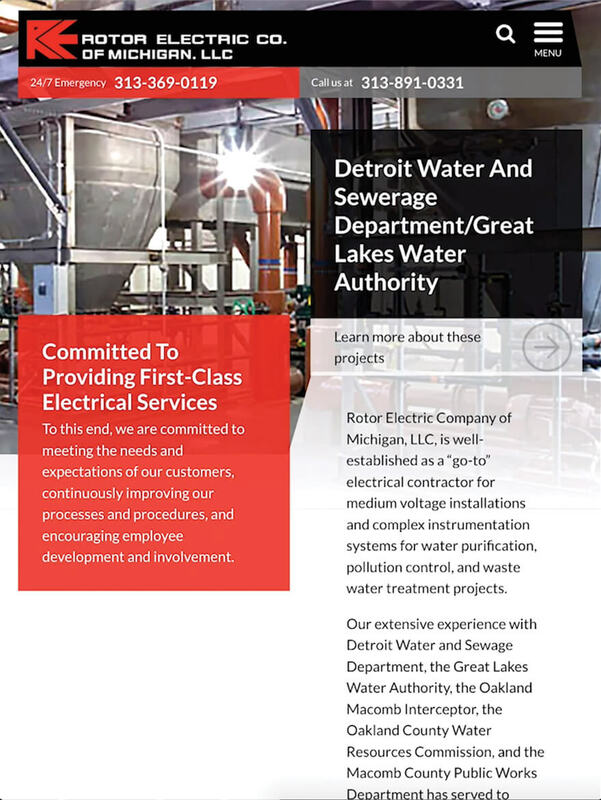 Rotor Electric Company was established in 1947 as an electrical contractor specializing in maintenance, repair services, and small construction projects in the Detroit area. On June 30, 2008, Rotor Electric Company cemented a 20-year working relationship, became a subsidiary of Motor City Electric Co., and began operating as Rotor Electric Company of Michigan, LLC. 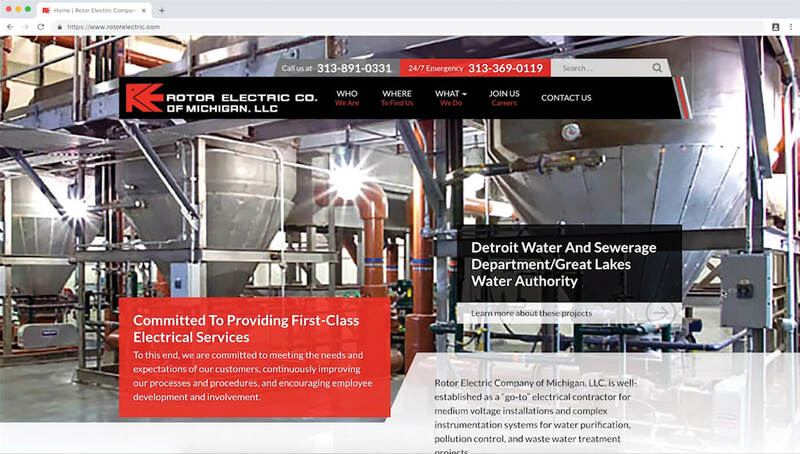 Rotor Electric’s parent company, Motor City Electric (MCE), asked TM to rebuild all of their subsidiaries’ websites. They requested that TM follow the branding and design of the MCE website, and ensure that the website could be easily used on not only desktops, but also smartphones and tablets. Search engine optimization was also a key request, along with creating a unique animation of their logo to be included in the footer of their site. TM helped MCE bring a consistent look and feel across all their subsidiary websites, and Rotor Electric was no exception. 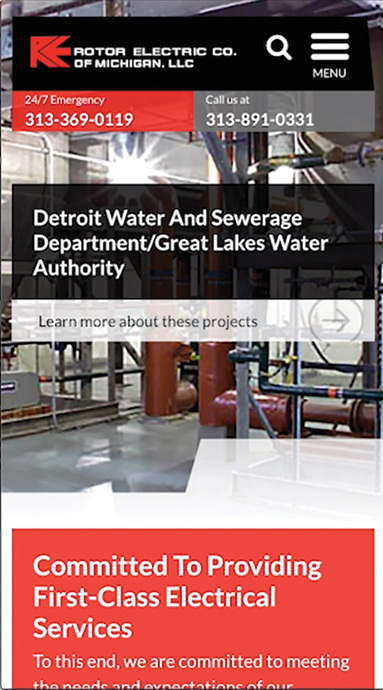 The site includes many of the same features and plugins of the MCE website, including the TM Project Gallery plugin and TM Job Posting plugin. The website also includes a custom-designed, custom-built logo animation that sits at the bottom of each page. It takes inspiration from the footer animations from the MCE website but is unique to Rotor Electric and its brand. The TM Project Gallery plugin generates a project grid listing after adding current or past projects. It shows the individual project listings complete with descriptions and a photo gallery. Along with a search filter, customers can also filter by service area to get a listing of projects specific to each service Rotor Electric offers. To differentiate Rotor Electric’s website and brand from its parent company’s site, TM designed a subtle graphic animation that is displayed in the bottom corner of each page. The animation takes inspiration from the rippling effect of water to create a minimalist, yet attention-grabbing visual that brings life to the website. To simplify the job hiring process, TM used the TM Job Posting plugin that was utilized for Rotor Electrics parent company, Motor City Electric. This makes it easy to create job postings that automatically sends job notifications when applicants apply for the positions listed. The data is emailed directly to Rotor Electric and stored in a database of submissions for easy access at any time.